Samford University’s Cumberland School of Law has once again been selected to participate in the National Civil Trial Competition (NCTC) in Los Angeles, California. More than 50 law schools nationwide applied to compete in the prestigious competition this year, and only 16 law schools made the cut. Loyola Law School, Los Angeles and the Santa Monica law firm Greene Broillet & Wheeler LLP are co-sponsoring the 14th annual NCTC, which will take place Nov. 15-17. The remaining 15 law schools selected for this year’s event include American University Washington College of Law, Baylor Law School, Campbell University School of Law, Chicago Kent College of Law, Duquesne University School of Law, Georgetown University Law Center, Loyola University of Chicago School of Law, Stetson University College of Law, Suffolk University Law School, Syracuse University College of Law, Thomas Jefferson School of Law, University of Akron School of Law, University of California, Berkeley School of Law, University of the Pacific McGeorge School of Law and Washington University, St. Louis. The NCTC involves 64 law student litigants representing their schools on teams of four. The students act as advocates/witnesses to perform opening statements, conduct direct-and-cross examination of expert and lay witnesses, make closing arguments, and argue objections based on the Federal Rules of Evidence. Each team argues its case in front of a panel of judges consisting of prestigious members of the Southern California Bar. Cumberland School of Law won the NCTC in 2013. The law students chosen to represent Cumberland School of Law at various national competitions, including the NCTC, will be determined based on the outcome of the Herbert W. Peterson National Trial Team Competition. “The Peterson,” as it is referred to in the halls of the law school, is a law student-run intramural competition that will take place during the weekends of August 21 and 28. The competition will be judged by numerous Alabama attorneys and judges from as far away as Mobile. The top students remaining after the final rounds of will be selected to perform an opening statement for Cumberland School of Law’s trial team coaches. Based on what they see, the coaches will select the members of Cumberland School of Law’s national trial team. In the past, anywhere from 14-20 students have been chosen to compete on the national trial team. The trial team coaches will then assess the selected students and divide them up into smaller teams of four to represent Cumberland School of Law in various national trial competitions. 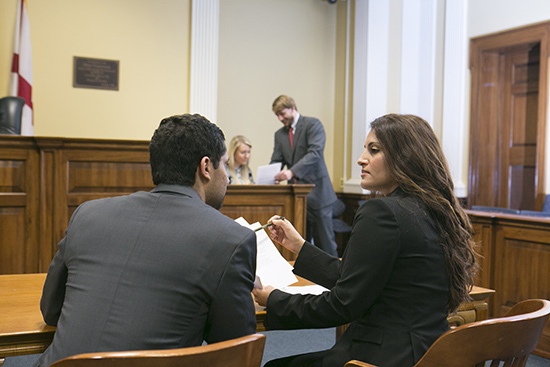 This fall, Cumberland School of Law students will compete in three national trial competitions: the Lone Star Classic Mock Trial Competition sponsored by St. Mary’s University School of Law in San Antonio, Texas, the Florida National Trial Advocacy Tournament sponsored by University of Florida Levin College of Law in Gainesville, Florida, and the Tournament of Champions sponsored by Washington University School of Law in St. Louis, Missouri.